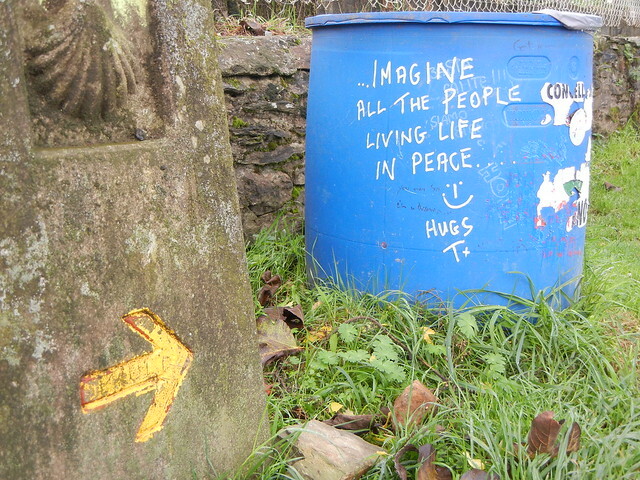 It took just a few words written on one garbage can that started me humming a tune that stayed with me all day: “Imagine there’s no Heaven…” So what was written on the next garbage can? “It’s easy if you try.” It went on like that, one garbage can after the other: “No hell below us; above us only sky. Imagine all the countries, living life in peace…” Meaningful words and a beatiful melody. Thank you, John Lennon. Just before we reached Arzua, 3.1 km from Ribadiso, a rainbow arched over the entire sky. Soon the rain was coming down in torrents. It was an ideal time for a breakfast of cafe con leche and big, crusty hunks of toast with marmalade and jam while watching the downpour from the warmth and comfort of a cafe. 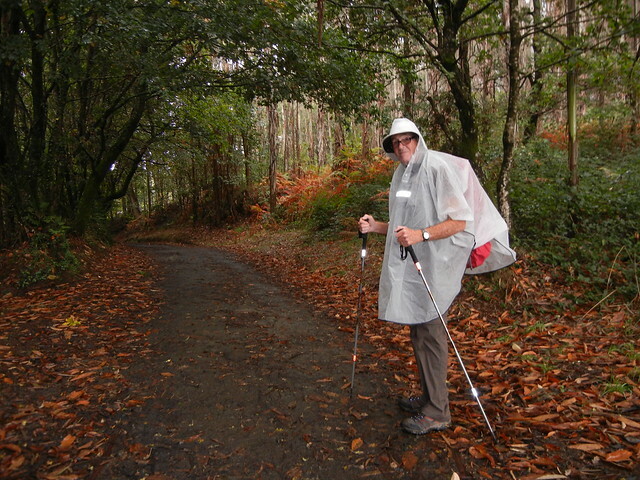 By the time we were ready to head back onto the trail, the rain was petering out somewhat. Arzua is the last major centre (population 7,000) before Santiago. 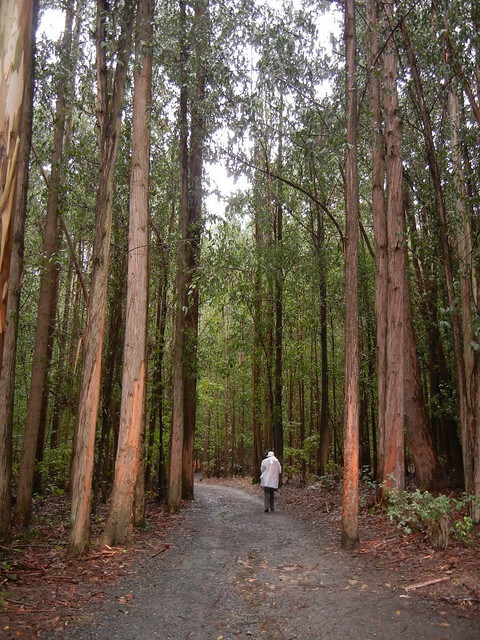 The Camino continued through the old part of town onto a delightful track, through ancient oak trees, and meandered back to the main road and over several small streams. We alternated between natural pathways, many of which had turned to mud with the rain, and country lanes through several tiny villages. 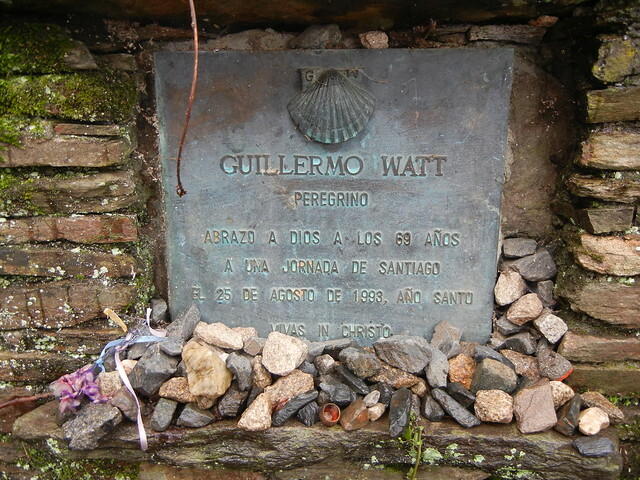 On one of the woodland paths, we came to a memorial to pilgrim Guillermo Watt, who died at that spot only a day away from Santiago. 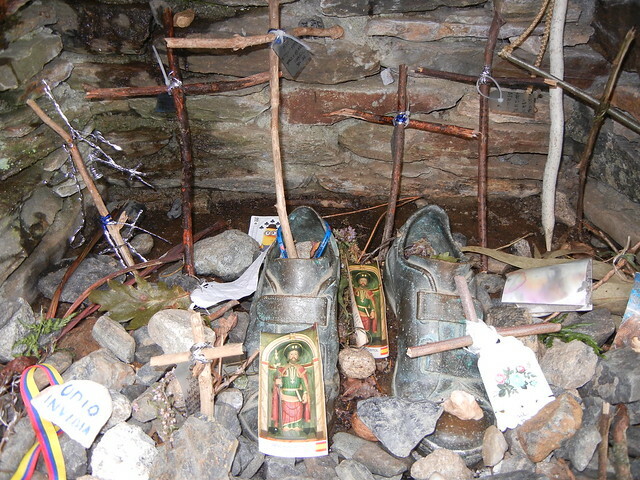 The memorial contained Guillermo’s bronzed hiking shoes. It couldn’t help but reminded us of the impermanence of life and how we shouldn’t take it for granted. 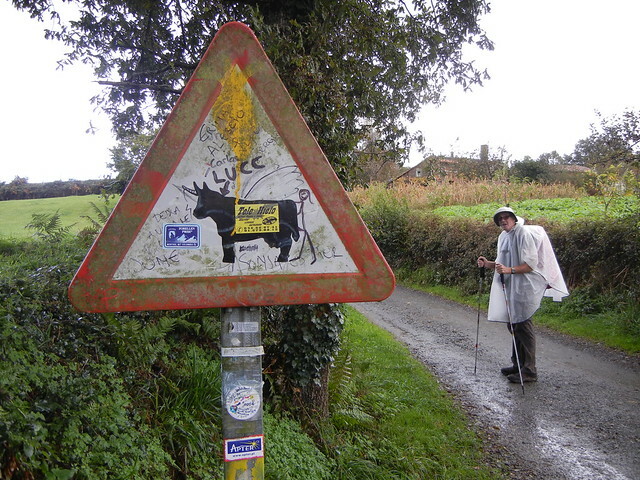 Guillermo had no idea he wouldn’t reach Santiago. He was so close, but his life on earth came to an end in an instant. It was not quite time for another cafe con leche, but circumstances changed our mind about that. We caught up with a group of peregrinos trailing behind a herd of cows going very slowly up the trail to pasture. Who knew just how far away that pasture was! A coffee shop appeared at the right moment for all of us. There was a group of six women and one man from various parts of the U.S. and Canada on a tour. The New Yorker said her husband is also on the tour but he isn’t walking. Maybe he is riding in the vehicle that is transporting their bags. The cameraderie going on with them all made me recall Garry telling us about his experiences when he was guiding tours like this. He knows it will be a success if just one person in the group is a comedian. He told us about one tour that worked out very badly. One person had a mental disorder and Garry spent 100 per cent of his time making sure she didn’t go off the deep end. That frustrated everyone else in the group. 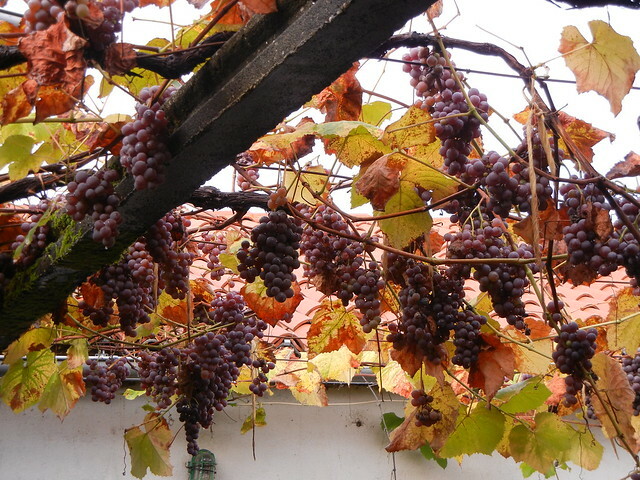 We continued for a total of 22.1 km to O Pedrouzo and stayed the night at the Pino Hotel. It was right on the highway but, thanks to double windows, it was quiet. All this walking results in ravenous appetites followed by plenty of good food and hot showers followed by sound sleeps. Congratulations to you both as you set out tomorrow on your final day to Santiago – one day of the initial schedule. What an achievement AND, you’ve done it without a single blister!!! Your almost at the finish line! What a accomplishment. Looking forward to seeing you both soon.